I don't usually use a nail enamel dryer because it seems like they often either a. don't work or b. make polish look dull. I came across this large, retro looking can several months ago (I think at CVS or Walmart?) and have been hooked ever since. 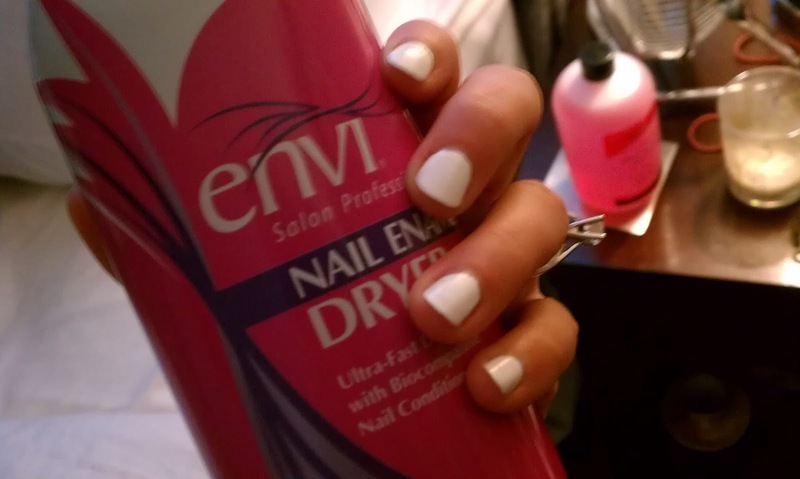 This cuts drying time in half, conditions nail cuticle and does not affect the color/shine. An even spray of Envi at about 3 inches from your nail sets polish to perfections in under 10 minutes. The unfortunate thing is I can't find this product online anywhere. So strange. This is a large can at 9oz, but it won't last forever, so I am on a mission to find this product again. Anyone else ever used this? i've never seen that! sounds cool :D want! I thought I was the only one who used this stuff. I've been using it for years and think its great! I either use this one or the other one by DeMert. They both do the same exact thing and aren't more than $4/. You're right though, sometimes it isn't easy to find this. I've only seen it at either CVS or Walgreens and sometimes they dont have it. Have you looked in either of those stores lately?